Abstract: Biotite is the dominant ferromagnesian mineral in different granites from the Cierna hora Mountains, in the Western Carpathians (Slovakia). A higher content of Fe3+ (up to 20 %) is characteristic for the biotites from I-type Sokol and Sopotnica granitoid bodies in contrast to the biotites from S-type Tahanovce granitoids showing decreased Fe3+ amount (around 5 %). The Fe/(Fe+Mg) ratio in biotites from the Sokol and Sopotnica massifs between 0.47 and 0.54 is rather low with respect to that in biotite from the Tahanovce [Fe/(Fe+Mg)=0.55–0.63] and Miklusovce [Fe/(Fe+Mg)=0.73–0.81] granite body. Water fugacities and contents calculated using Wones’ (1981) calibration of biotite stability equation and Burnham’ (1994) water dissolution model yield relatively similar values of 4–5 wt. % in remaining melts at 400 MPa and various levels of fO2 and activities of annite for magnetite-bearing assemblages. This suggests an effective buffering role of biotite in both oxygen and water fugacities. Comparison of the peraluminosity index (A/CNK) of biotite with the same index in whole-rock shows distinctly higher A/CNK values for biotite indicating its aluminous character and important role as a significant aluminium carrier. The biotite composition indicates that granitoids in the Cierna hora Mts can be primarily derived from the lower crust; their protolith was influenced by mixing and/or assimilation process. Abstract: We apply zircon and apatite fission track thermochronology (ZFT and AFT, respectively) to the Variscan crystalline basement of the Mala Fatra Mts (Central Western Carpathians) in order to constrain the thermal history. The samples yielded three Early Cretaceous ZFT ages (143.7±9.6, 143.7±8.3, 135.3±6.9 Ma) and one Eocene age (45.2±2.1 Ma), proving that the basement was affected by a very low-grade Alpine metamorphic overprint. Although the precise timing and mechanisms of the overprint cannot be unequivocally resolved, we propose and discuss three alternative explanations: (i) a Jurassic/Cretaceous thermal event related to elevated heat flow associated with extensional tectonics, (ii) early Late Cretaceous thrusting and/or (iii) an Eocene orogeny. Thermal modelling of the AFT cooling ages (13.8±1.4 to 9.6±0.6 Ma) revealed fast cooling through the apatite partial annealing zone. The cooling is interpreted in terms of exhumation of the basement and creation of topographic relief, as corroborated by the sedimentary record in the surrounding Neogene depressions. Our AFT results significantly refine a general exhumation pattern of basement complexes in the Central Western Carpathians. A younging of AFT ages towards the orogenic front is evident, where all the external massifs located closest to the orogenic front (including Mala Fatra Mts) were exhumed after ~13 Ma from temperatures above ~120 °C. Abstract: The upper part of the Middle Coniacian/Santonian–Middle Campanian deep-water Dol Formation of the island of Brac is composed of countless fine-grained allodapic intercalations deposited in an intraplatform trough. Within the studied section 13 beds can be distinguished, each defined by its lower part built up of dark grey limestone with abundance of branched, horizontally to subhorizontally oriented burrows, and the upper part, in which the light grey to white limestone contains larger burrows, rarely branched, showing no preferential orientation. The lower, dark grey, intensively bioturbated levels are interpreted as intervals formed during high-frequency sea-level highstands, while the upper, light grey-to-white levels are interpreted as intervals formed during the high-frequency sea-level lowstands. Cyclic alternation of these two intervals within the fine-grained allodapic beds is interpreted as the interaction between the amount of carbonate production on the platform margin and the periodicity and intensity of shedding and deposition in the distal part of toe-of-slope environment, which is governed by Milankovitch-band high frequency sea-level changes. Abstract: During the Late Cretaceous to Paleogene the Magura Basin was supplied with clastic material from, non-existing today, source areas situated on the northern and southern margins of the basin. The northern source area is traditionally connected with Silesian Ridge, whereas the position of the southern one is still under discussion. The Upper Eocene–Oligocene pebbly mudstones of the Tylicz/Krynica facies zone contain exotic material derived from the south-Magura source area. The studied pebbles and clasts contain fragments of crystalline rocks, derived from a continental type of crust, and frequent clasts of Mesozoic to Paleogene deep and shallow-water limestones. Volcanites, rarely granitoides as well as schists, gneisses, quartzites and cataclasites were found in the group of crystalline exotic pebbles. The isotopic ages of “exotic” pebbles from the Tylicz section document a Variscan age of plutonic and metamorphic rocks. The composition of the Tylicz exotic conglomerates occupied the transitional position between the Jarmuta/Proc (Maastrichtian–Lower Eocene) and Strihovce (Eocene) exotic pebbles. The provenance of these rocks could be connected with Eocene exhumation of the SE sector of the Magura Basin basement. Another possibility can be explain by supply of siliciclastic material from a SE source area (Dacia and Tisza Mega-Units) and carbonate material from a S source area (ALCAPA Mega-Unit: Central Carpathian Block and Pieniny Klippen Belt). Abstract: The Sava Depression and the Bjelovar Subdepression belong to the SW margin of the Pannonian Basin System, which was part of the Central Paratethys during the Pannonian period. Upper Pannonian deposits of the Ivanic-Grad Formation in the Sava Depression include several lithostratigraphic members such as Iva and Okoli Sandstone Member or their lateral equivalents, the Zagreb Member and Lipovac Marlstone Member. Their total thickness in the deepest part of the Sava Depression reaches up to 800 meters, while it is 100–200 meters in the margins of the depression. Deposits in the depression are composed of 4 facies. In the period of turbiditic activities these facies are primarily sedimented as different sandstone bodies. In the Bjelovar Subdepression, two lithostratigraphic members (lateral equivalent) were analysed, the Zagreb Member and Okoli Sandstone Member. The thickness of the Bjelovar Subdepression ranges from 50 meters along the S and SE margins to more than 350 meters along the E margin. Generally, detritus in the north-west part of the analysed area originated from a single source, the Eastern Alps, as demonstrated by sedimentological and physical properties, the geometry of the sandstone body and the fossil content. This clastic material was found to be dispersed throughout the elongated and relatively narrow Sava Depression and in the smaller Bjelovar Subdepression. Sedimentation primarily occurred in up to 200 meters water depth and was strongly influenced by the sub-aqueous paleorelief, which determined the direction of the flow of turbidity currents and sandstone body geo¬metries. The main stream with medium- and fine-grained material was separated by two independent turbiditic flows from N-NW to the SE-E. Variability in the thickness of sandstone bodies is the result of differences in subsidence and cycles of progradation and retrogradation of turbidite fans. 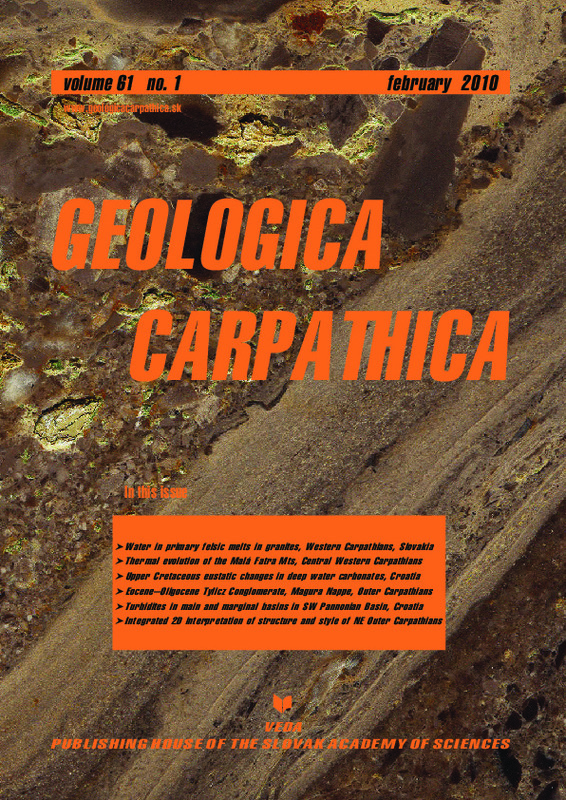 Abstract: Integration of the information from surface and subsurface geological exploration (maps and well sections) and results of geological reinterpretation of more than ten archival seismic sections and several dozen magnetotelluric soundings (MT; published and archival) implies a new structural picture of the Carpathian tectogene, interpreted to depths exceeding 10 km. The tectonics of nappes and their basement is illustrated by four regional cross-sections (derived from geological and petroleum-exploration traverses) and examples of detailed interpretation of zones with complicated structure, as well as results of testing the initial structural models with application of the balanced cross-section method and gravimetric modelling. In the tectonics, a complicated system of overthrusts and detachments of sedimentary covers (from their heterogeneous basement) represents a predominant feature. It induced, within particular nappes and tectonically altered structural-facies units, specific systems of narrow folds with diversified geometries. Broad folds of the intermediate structural stage, which are gently sloping in the hinterland of the nappes, were interpreted on the basis of geophysics as paraautochthonous elements. They cover deep-seated faults with large throws, which obliquely or subvertically dip to the SW and were distinguished in the basement on the grounds of extreme contrasts at the resistivity boundaries. Zones of dramatically low resistivities, which separate blocks of the uplifted basement, were interpreted as tectonic sutures with geometry rebuilt in the stage of the Neogene lithosphere subduction. Therefore, the structural layout of the sedimentary cover is characterized by more gently dipping nappe overthrusts of the sequential type and secondary, out-of-sequence thrust slices, most frequently imbricate ones. The flysch covers resting over the tectonic sutures, particularly in margins of inherited structural depressions, are characterized by more diversified tectonic style in comparison with peripheral, gently-sloping covers thrust over the flexural platform slope, and with steep slices and imbricate thrusts having consequent NE vergence. A specific type of dislocation is represented by flat inversional detachments (seismically documented) which are accompanied by disharmonic folding of “thin-skinned” structural elements. In the eastern part of the foreland of the Dukla overthrust, they form a developed system of backthrusts on the slope of a triangular structure superposed on a “shallower” tectonic suture of the basement; the system replaces sets of fault-propagation folds developed in the eastern part of this zone.